It is always easy to remember the first time: 11 November, 1974, Hammersmith Odeon. Sparks. I cannot recall the exact seat where I was sitting when I lost my rock 'n' roll virginity, but it was the second stalls block on the left and the seasoned gig-goer on my right tipped me off that you can tell when a band is going to do an encore because the roadies leave the amps turned on. Look out for the red light. Sure enough, Ron and Russell Mael returned to do their biggest hit to date, "This Town Ain't Big Enough for Both of Us". Nearly four decades on they were back in West London last night with their latest show, Two Hands, One Mouth. 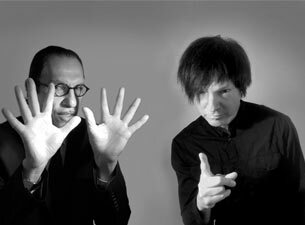 This time the brothers Mael have dispensed with a band and gone duo. The idea behind the concept is that they wanted to deconstruct their back catalogue, but it cannot have escaped their notice that this is also surely a more financially sound way to tour in these straitened times. This was their debut public performance in this format, but a UK tour is already scheduled for this autumn and judging by their debut double act outing it will be an unalloyed treat. Sparks was always an intriguing, idiosyncratic, culturally literate outfit, formed by two American siblings who could not have appeared more different. The Chaplin-tached, nightmare-prompting Ron sat impassively at the keyboards, while tousle-haired Russell leapt around like a loon. At Bush Hall, apart from one glorious showstopping moment from Ron that was part-Running Man, part-David Brent, they stuck rigidly to their roles. They seemed pretty ageless too. Ron always looked in his sixties, which, handily, is what he is now. The music was pretty timeless too. Although there was no band to beef up the sound this was definitely not Sparks Unplugged. The career-spanning gig opened with an instrumental greatest hits overture from Ron to cheers of “Ron! Ron! Ron!” and once Russell joined in one barely noticed the absence of other musicians on tracks such as the swooping, sweeping "Under the Table with Her" and the dark yet Disneyish "Hospitality on Parade". Their songs often feel like pocket-sized pop epics, taking Queen's pomposity and shrinking it down to palatable proportions. Russell – thankfully – is no Freddie Mercury but his fabled falsetto on the likes of vintage numbers "Looks, Looks, Looks" and "Never Turn Your Back on Mother Earth" must have had W12’s canine population wondering what was going on. In fact it was only on the iconic "This Town Ain't Big Enough..." that one missed the band when the buzzing guitar motif failed to materialise. Elsewhere, such as during excerpts from the band's comically pretentious mini-opera "The Seduction of Ingmar Bergman", the sparseness and simplicity of the arrangements worked in their favour. This seemed a lot less like an option born out of financial prudence and more like a canny reinvention. After nearly 90 minutes the encore – I couldn't see the amps for the crowd this time, but I'm sure they stayed alight – underlined how pioneering the band was. "Number One Song in Heaven" and a gutsy, energetic “Beat the Clock” reminded fans of their distant disco past when they collaborated with Giorgio Moroder. With Ron expressionless at the keys and Russell singing, suddenly the Pet Shop Boys, who emerged half a decade later, did not seem quite as groundbreakingly original. It has been a poignant time for pop recently with the deaths in quick succession of Bee Gee Robin Gibb and dance music legend Donna Summer. But this triumphant gig demonstrated that another musical family is still going strong and that Giorgio Moroder's disco legacy lives on in these wonderfully eclectic, gloriously oddball Maels. Sparks perform "This Town Ain't Big Enough for Both of Us"